Can you tell us about your lovely label, Mrs Peterson Pottery. Mrs Peterson Pottery started when my friends began buying my work from my kitchen table. 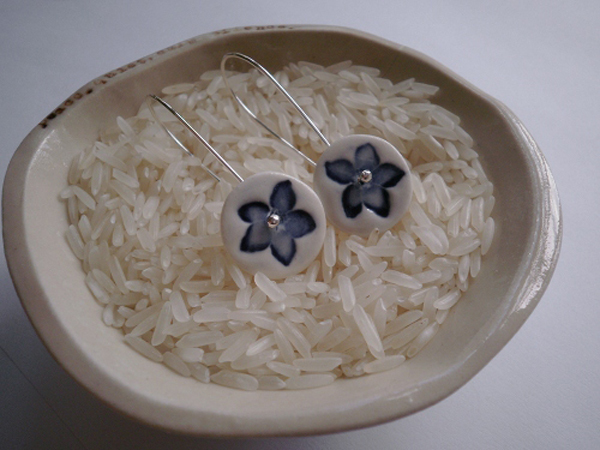 I started making porcelain jewellery and little homewares and would always do a few extras. 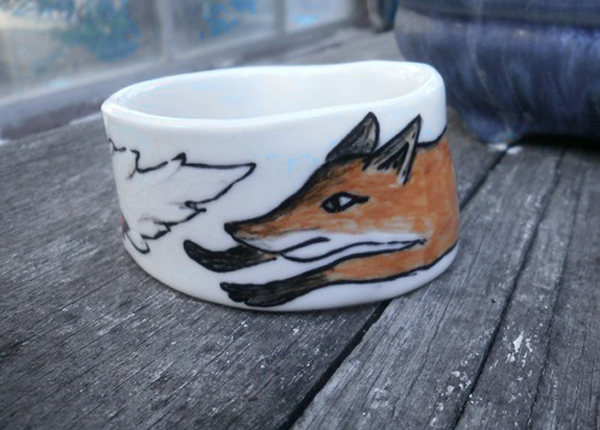 Every time I would unpack the kiln, things would sell and so I started my online shops and the occasional market. Things just grew from there. I began getting wholesale enquiries and magazine interest. I never set out to become a business, just to make things I wanted to see in the world. Jewellery that I wanted to wear that I couldn’t find anywhere, somehow I’ve been lucky as I’ve barely done any marketing! The right people seemed to just take an interest in my work. I called it Mrs Peterson Pottery because I NEVER wanted to get married, and when I did, my friends and I use to joke about me being Mrs Peterson, I would answer the phone “Hello this is Mrs Peterson speaking” just for kicks! So this is me, and my pottery. 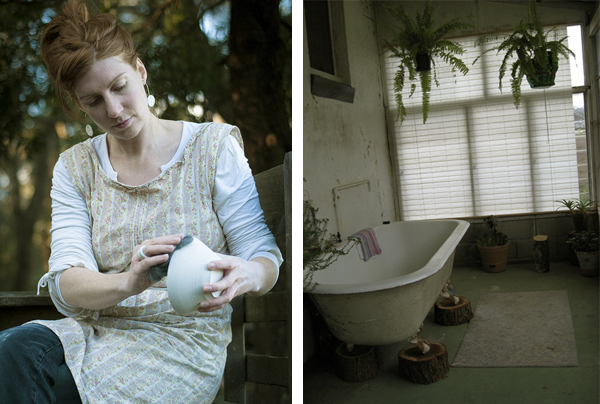 When I was a kid, I spent visits to my Nanna’s house in her pottery studio. I was free to make anything my heart could imagine. She’s 90 now and well retired, but I still have my hands in clay, I’m obsessed with porcelain. I studied fine arts near Sydney and loved printmaking and ceramics, photography too but I dropped out after the first year to go travelling and met my husband Mr Peterson. Until a few years ago I’d had an on-again off-again relationship with ceramics. A few cranky potting teaches re-affirmed my doubts that I couldn’t do it right and that there was a ‘right’ way of doing things and a ‘wrong’ way… and if I did something the wrong way, well… out came the cranky teachers and I would cower like a school girl! It took a long time to finally say “F**k it, I’m going to make what makes my heart happy!” That’s when Mrs Peterson Pottery was born, that’s the stuff that people go “ooohhh!” over! I’m tired of the idea there is only one way to do things, or that you have to fire with a wood kiln and be a judgemental old cow to be a real potter. 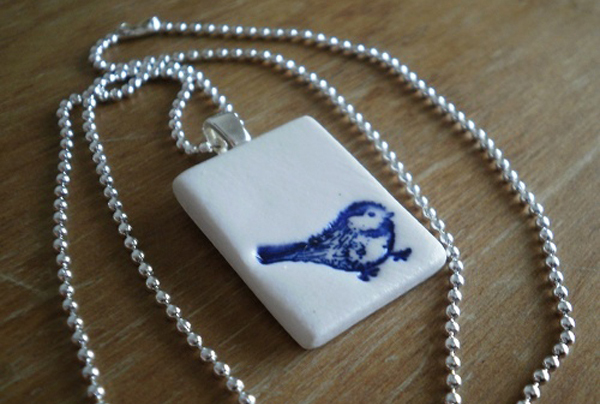 The young and talented ceramic artists I know are full of passion, skill and imagination. It’s refreshing to be around. My Nanna still encourages me without judgment, she says ceramics are making a come back… and I believed her. How do you think living in the Blue Mountains your work process, and the outcome of your products? I have travelled and moved about so much that I never feel like I am ‘from’ anywhere, but I keep returning to these mountains. I just love it here. I feel at home in a rickety old cottage with a wood stove and lots of night stars. Walk 5 minutes and you’re standing on the edge of a huge cliff, or looking over a valley. That kind of perspective, space and fresh air is addictive. I lived in London for a while and though I loved it, I was constantly anxious, this place and lifestyle set up the right headspace for me to be creative. I sit in my studio and drink lots of tea listening to the radio while I produce work that makes me smile, what better way to pay the rent? I’m full of gratitude and my business tends to flow because of this. I never started out to run a small business – it just kind of happened and I went with it! 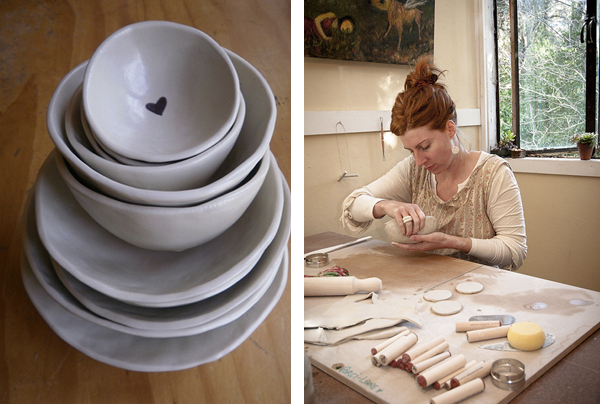 What do you love about working with fine porcelain? My God… EVERYTHING. I’m in love with the high temperatures that porcelain is fired at. I like it hot! I can be difficult to work with if you’re having a clumsy day. It’s very fine and can crack easily, it doesn’t tend to join as well as other clays and it can also warp in the kiln, that said I LOVE it! It’s fine and white and clean and super smooth if you sand it like a pro. My Nanna says the first time she held a lump of porcelain in her hand her heart started beating fast. When she told me the story, the penny dropped and I saw my genetic makeup right before my eyes! I feel like a small child in the world of porcelain, there’s so much to learn and I love a challenge. Where do you get the inspiration for your designs and what are you loving at the moment? 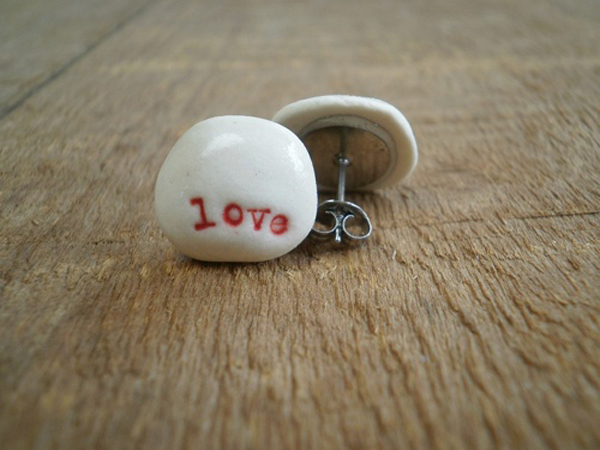 I started by making things that were like tiny everyday reminders or mantras for life. Things that mattered to me like being kind and letting go in a world that is in so much turmoil and chaos most of the time. I needed to wear earrings and rings that said “calm down” so I wouldn’t have a panic attack every time I drove from one side of Sydney to the other! I love my meditation and yoga and wanted to bring that into the clay. There is a need for jewellery and objects we own to have meaning and help us live a blissful and conscious life. I want to make things that are beautiful and that also remind us to take a moment to relax in a mental world. At the moment I’m loving experimenting with recycled glass and crackle glazes, especially with antique designs. (Magarita mix bottles work well so it’s my job to drink cocktails in order to use the recycled glass). I’m also loving my friend Helen from Kanimbla Clay’s incredible tea-lights… she picks leaves and stems from her veggie patch to use in her work and they glow like nothing I’ve ever seen before! Clever girl, her lights are all over my house. How important is it to you to use recycled materials and what choices do you make to ensure this? When I lived in London I worked in the corporate world as Freelance Trainer, running workshops on Environmental Practice. I learnt so much about REDUCE/REUSE/RECYCLE that it’s all stuck! I have a thing for brown recycled paper anyway, so that helps! I shred all the old newspapers and scrap paper for my packaging and there is very little wastage with the clay. All the offcuts are put into buckets of water that just get reconstituted back into more clay. The shelves and displays for the markets are salvaged cutlery draws from the council chuck-outs that I sanded and filled with rice. The tree stumps I use for displays are from worksites that my man brought home for me (he’s a tree guy). We are both always looking out for recycled timbers and things we can reuse. There is so much wastage in the world! One day he dreams of building a tree house from reused materials. Mrs Peterson Pottery is the ceramic version of that treehouse… tread lightly I say! Just wanted to say I am a huge fan of Mrs. Peterson’s Pottery. I love the creativeness and the passion that is put into every piece. I am so glad you didn’t listen to those cranky pottery teachers and believed in yourself to pioneer something different. It brings a freshness to this art form. I look forward to seeing more creative pottery on your website.Only stop when the passion for it runs dry and I hope that will never happen.